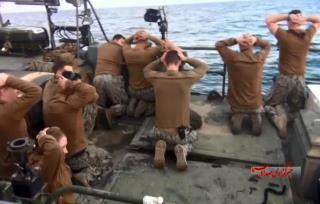 (Newser) – The commanding officer responsible for 10 sailors captured by Iran is no longer commanding anybody. The Navy says Cmdr. Eric Rasch of Coastal Riverine Squadron 3 has been fired because of a "loss of confidence" in his ability to command after the embarrassing international incident in January, the Navy Times reports. Sources tell Reuters that other sailors involved in the incident have also been disciplined. A point is being missed here. I do not believe they made a mistake; TWO BOATS? GPS and radio com contact? I'd speculate it was to see what would happen and a scapegoat is being used to cover it up. The "Iran Deal" was an unauthorized shortcut. Remember when John Kerry "thanked" Iran ? Can't America fire him ? And why not the "Commander-In-Cheif " ? BOO-HOO! Loss of CONFIDENCE?! I wonder how he EVER became COMMANDER!